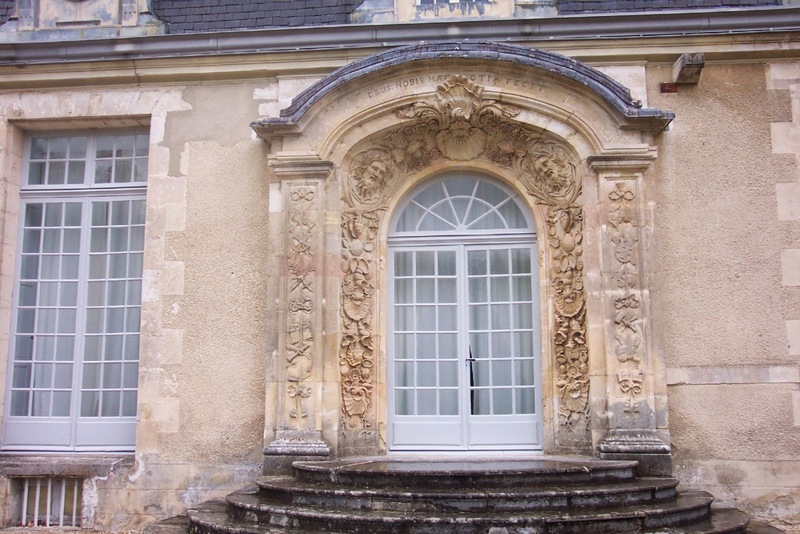 The ornately carved Porte d'honneur at Cirey was commissioned by Voltaire himself. 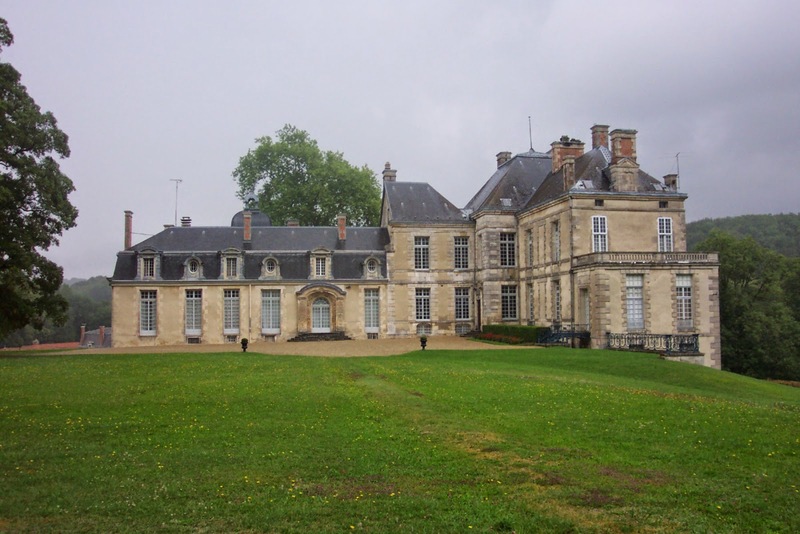 In 1735, with a lettre de cachet hanging over him,he had taken sanctuary at the chateau and set about a programme of renovation and refurbishment in eager anticipation of Madame du Châtelet's arrival. (He apparently financed the work using money acquired through speculation in wheat and supplies for the French army). The result was the new wing, with its splendid doorway giving directly onto the grand salon. 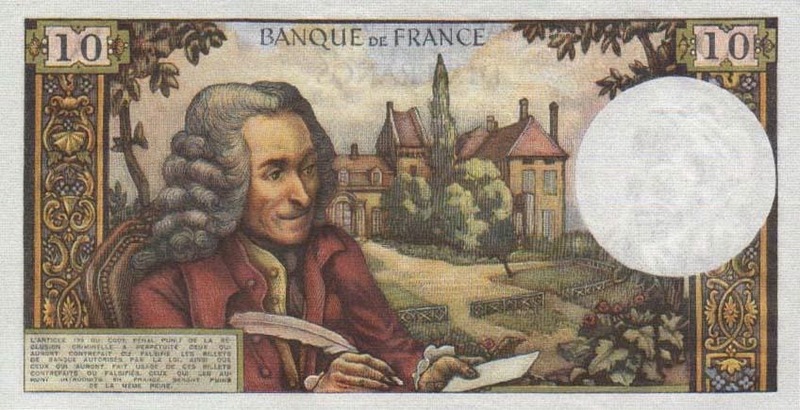 You can see it clearly in the picture of Cirey on the old "Voltaire" ten-franc banknote. 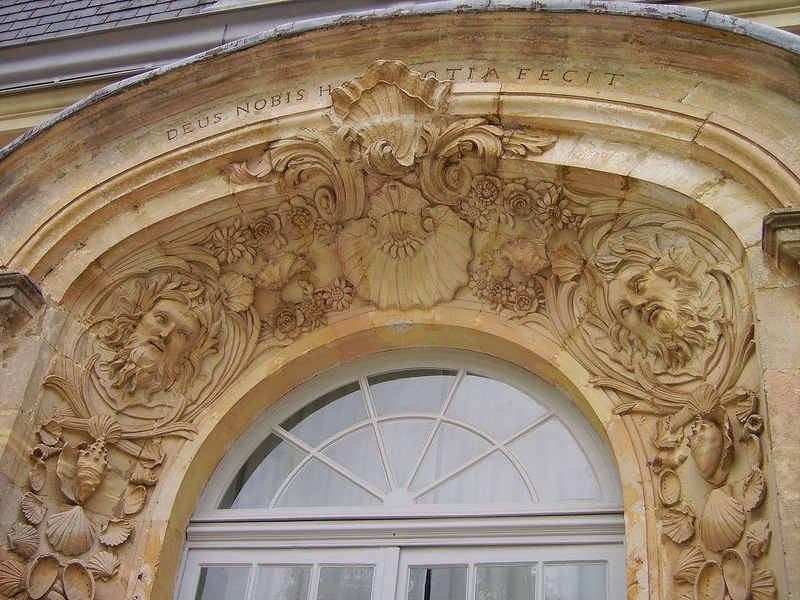 Above the arch Voltaire has placed an inscription from the Bucolics of Virgil, "Deus nobis haec otia fecit", "God has given to us this leisure", an allusion to the enforced idleness of his stay in Cirey. The pillars on either side of the door feature attributes of the arts and sciences; they may perhaps be Masonic symbols. 1. A terrestrial globe with meridians, and a telescope - possibly a reference to Madame du Châtelet's astronomical interests. 2. A set-square, compass, plumb line - again an intellectual allusion or freemasonry signs? 3. Two vines. These correspond to a human head on the right pillar - signifying perhaps "man in the face of Nature". "Here the poet, who loves virtue and scorns the crowd and the Court, cultivates friendship, remaining hidden in rural retreat"
5. An inkwell and pen symbolising literature. Que promettait en vain le monde"
1. Globe with a set square, perhaps signifying moral rectitude. 4. Mallet and scissors, for sculpture. 5. Is there something else here? Prof. Saget doesn't say and I can't make it out. The post of honour is a private station"
Hubert Saget, Voltaire a Cirey, (2nd ed 2005) p.146-50.